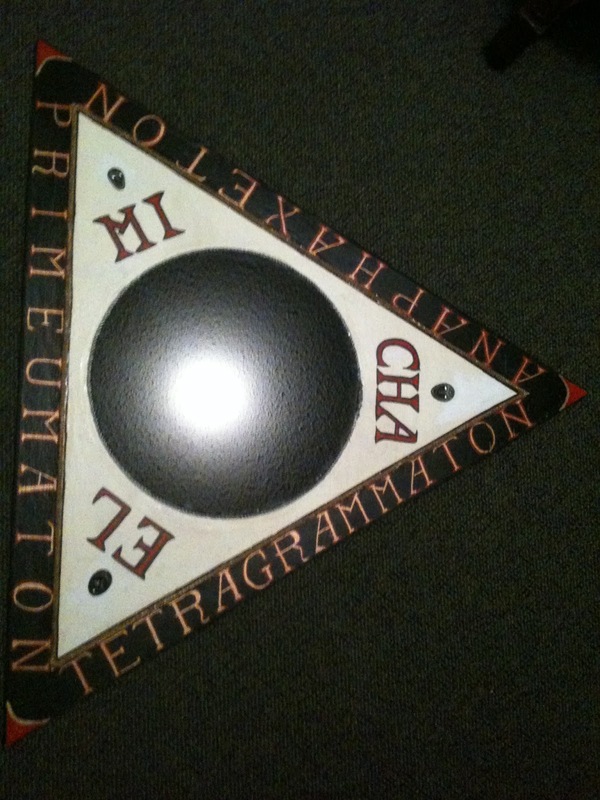 Back when I began my serious experiments in Goetic work (some 14 years ago), I began like many did thanks to a certain Frater…with the black mirror int he center of an upright triangle. This early ‘Triangle of Art’ was made with plywood, adhered rope, black scrying mirror, magnetic tape boarder, and added 3 flat stone face carvings. This was used during my earlier explorations into Goetia after my initial experiments with floor manifestation. Found both systems had merit and could be worked. Much has progressed since then and I do not use the mirror for current GoS evocations. I did not ‘distort my face’ for skrying as the image came in time of it’s own accord. Sometimes other distracting images/ beings would drift through mirror as well. If anything, I accredit this ‘Poke’ system to developing my skrying abilities which I’ve used for other systems and my current work involving the Almadel.